Discussion in 'TV on DVD and Blu-ray' started by Ronald Epstein, Jan 31, 2019. 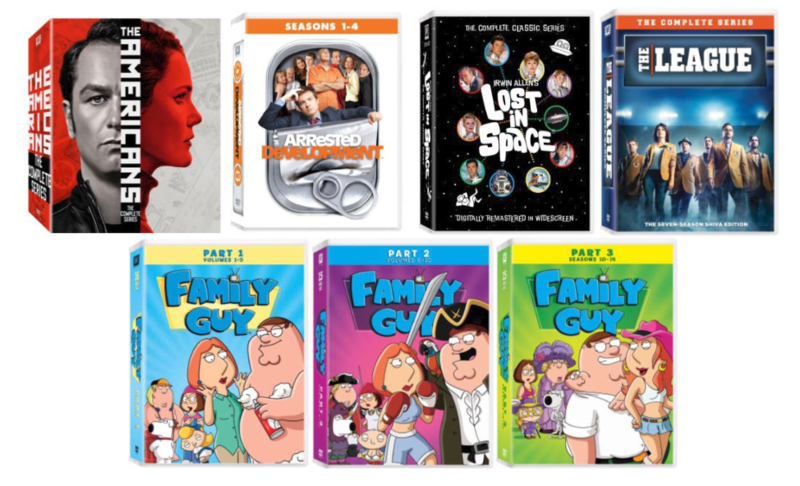 LOS ANGELES, CA (January 31, 2019) – Twentieth Century Fox Home Entertainment is releasing seven new box sets: The Americans: The Complete Series, Arrested Development: Seasons 1-4, Lost in Space: The Compete Classics Series, The League: The Complete Series, and Family Guy: Part 1 (Volumes 1-5), Part 2 (Volumes 6-10), and Part 3 (Seasons 10-14) on DVD February 5th. The Americans is a period drama revolving around the marriage of two KGB spies, Philip and Elizabeth Jennings (Emmy Award® winner Matthew Rhys and nominee Keri Russell), who pose as Americans in Washington, D.C. They undertake risky covert assignments all while raising two children (Holly Taylor and Keidrich Sellati), running a travel agency, and befriending their FBI agent neighbor (Noah Emmerich). The complete series box set features all six enthralling seasons. Watch Season One, where George Bluth, Sr. sits in jail for his shifty accounting practices. With all their assets frozen, the Bluths, who are not qualified to do much, might have to get jobs! In Season Two, Michael hears that his father has escaped from prison and that now he could face time in prison because of the family’s shady business dealings with Iraq. George Sr. sets off to Mexico while Michael tries to clear his name. In Season Three, Uncle Oscar serves in prison and Michael puts George Sr. under house arrest. Buster and Michael journey to Iraq, learning which family member is the real brains behind the business. In Season Four, the Bluths have gone their separate ways, but continue to be as wildly dysfunctional as ever. Enjoy the timeless journey of Irwin Allen’s LOST IN SPACE® in this massive 17-disc set which contains all 83 episodes fully remastered. Follow the heart-racing, cliff-hanging adventures of Prof. John Robinson™ and his family aboard the Jupiter 2™, along with Robot B9™ and Dr. Zachary Smith™. Get ready for full-contact laughs with Ruxin, Kevin, Andre, Pete, Jenny and Taco, a tight crew who always commit to an all-out blitz of ruthless fantasy football competition. All seven seasons of TV’s most outrageously funny comedy make one impressive package filled with collusions, cons and lineup fiascos. Start from the beginning of TV’s most outrageously irreverent animated comedy with the first five hilarious volumes. Get reintroduced to manchild Peter Griffin, his doting wife Lois, their first-born Meg, sweethearted Chris, pretentious canine Brian, and Stewie the diabolical baby genius. Enjoy the continued adventures of the Griffins with volumes six through ten. Watch Peter, his family, and his loyal friends find their way in and out of trouble while dealing with Giant Chickens, Evil Monkeys, and everything in between. Catch up with the Griffins and their off-the-wall antics when you watch Seasons 10 through 14. In this hilarious collection, you’ll get a behind-the-scenes look at the making of the show, travel to Springfield as the Griffins meet another dysfunctional TV family, and much more. That Lost in Space would probably be the only thing that would have any value to me, it being the kind of stuff I usually like to see! Enjoy the continued adventures of the Griffins with volumes six through ten. Catch up with the Griffins and their off-the-wall antics when you watch Seasons 10 through 14. They are also streaming all the episodes on Hulu now and they look good. I'll have to check that out sometime-- thanks for the tip! I notice that the photo of the Lost In Space complete series box has the four dreaded words, "digitally remastered in widescreen", so no way am I buying this, I'll gladly stay with the original DVD sets that are in full screen 4 x 3. The episodes in the original DVD sets look fine to me, I don't need them to be "digitally remastered", especially if they are ruined by being done in widescreen 16 x 9. Flashgear, TravisR and atcolomb like this. They changed the numbering scheme on the sets after a while. Volumes 6 through 10 were actually, like, seasons 5-9. The volume label was left over from the original releases and when they put seasons 1-2 out in one set, then split season 4 up into two volumes after the return. Then they finally started calling the sets "season" instead of volume somewhere around season 11, so I believe the original sets have both a volume 11 (made up of season 10) and a season 11. I don't see why anyone would buy Lost in Space on DVD since it's been released in pristine quality on Blu-ray and is available for only $75 on Amazon. How about Fox gets around to remastering some of their MTM catalog instead, starting with St. Elsewhere - the best hospital drama ever! How about Fox gets around to remastering some of their MTM catalog instead, starting with St. Elsewhere - the best hospital drama ever! And long overdue too-- it's been more than a decade and counting since that first go was released! If Fox is unwilling to do the heavy lifting on St. Elsewhere then farm it out in hi-def to Mill Creek for a deep catalog release. Fox dragged their heels on Lost in Space. They refused to do a Blu of it until the foundation established by the late Irwin Allen's widow (now, also deceased) did the funding to remaster the image from original negatives. Since we've moved into 4K, has anyone tried watching their tired old DVD masters of a lot of these shows on their new sets. It's a painful experience. No. TV shows need to go Blu - period. And those limited by their 'tape' rather than film elements, need stabilization applied and then still get ported over to Blu. Fraggle Rock is the perfect example of how much can be done with limited source materials. Will it ever look pristine on Blu? NO! Will it look a hell of a lot better if a little, time, care, and money is properly applied. You bet! Time's a wastin'. Time to get busy. Please. Flashgear and MatthewA like this. Lost in Space was an actual Fox production, so it likely has more importance in the eyes of the studio. IIRC, there were also no pop songs to clear. Yes, and Fox released an utterly poor DVD set many years ago before the Irwin Allen Foundation got behind the Blu-ray release. Fox wanted no part of the Blu, feeling the DVD's were sufficient. The whole thing was detailed at the time by Allen's late widow in several articles. Studios remain shortsighted where their back catalogs are concerned. Fox among the lot, in some cases, the greatest transgressor of them all. MatthewA, BobO'Link and bmasters9 like this. And just what exactly is so utterly poor about the Lost In Space DVD's from Fox studios?? The DVD's look fine to me, full screen format 4 x 3 and the episodes are uncut, but there will always be those who like to find something to complain about. Just like these complainers who whine about Time Life supposedly doing such a poor job with the Rowan & Martin's Laugh In DVD's. Let them whine, I don't pay attention to that nonsense either, Those DVD's are fine also, full screen 4 x 3, uncut shows, there is nothing wrong with them. Okay, so in addition to the incorrect telecine leading to most of the B&W episodes adopting a greenish tint (I suppose you could shut off your color altogether), several episodes suffered from weak contrast, while others were overly dark. Add to this, the absolutely horrendous chroma bleeding that afflicted fine detail, particularly all those metallic fabric suits, not to mention the fine-line jaggies that cropped up on all the fine hatch and tight horizontal details of the Jupiter spaceship, and hey, I guess if you're not discerning, it was good enough. But honestly, unless you've owned both sets (and I do) you really can't decide accurately just how much of a quantum leap forward the Blu-ray remastering was by direct comparison. There is NO comparison, folks. The Blu of Lost in Space is superior in all regards and should be on everyone's top shelf of must haves. The old DVD's are a Frisbee, and reissuing 'remastered in widescreen' DVD's now, some 3 years after the Blu release is absolutely pointless! Dumb waste of money that could have been spent by Fox bringing more, as yet unreleased, TV to DVD and Blu-ray instead. Thanks for your explanation, I imagine it's possible a better job could have been done but honestly the technical stuff doesn't usually bother me. I have the original Lost In Space DVD sets from Fox studios, 1st season is in one volume and seasons 2 & 3 have two separate volumes. The episodes overall look fine to me and they are uncut which in my opinion is the most important thing. I don't have a Blu-ray player and currently don't plan to invest in one, I'm staying with DVD. I agree that Fox reissuing Lost In Space on DVD in widescreen 16 x 9 is pointless and a waste of money. Instead, Fox should release on DVD the long awaited 3rd and final season of The White Shadow. That would be a step in the right direction. Just a quick note, the original Fox DVDs of Lost in Space do have some cuts here and there. Not major, no scenes are missing, but some dialog is. All of the missing stuff was restored to the Blu Ray prints. The Blus aren't perfect either (some audio tinkering for the most part), so if you are really totally fine with the original DVDs, enjoy! But the picture really is a quantum leap forward. The new widescreen DVDs aren't aimed at us. They're aimed at the mass market consumers who will see the set for $20 at Walmart and say "hey, I heard of this show. 20 bucks! And no annoying black bars on the sides? I'm in!" If there are dialog edits to some Lost In Space episodes on the DVD's, it must be very minor because the episodes run in the 51-52 minute time range. I'm not an expert on the series but haven't noticed anything obvious where some dialog might be cut. They were very minor, but who likes any edits? The episodes that I remember missing either dialog or have random seconds snipped are "Invaders from the 5th Dimension," "Return from Outer Space," "Prisoners in Space" and, I think, either "Revolt of the Androids" or "Treasure of the Lost Planet." Since I rather hate that portion of the second season, I'm not 100%. However, the HD prints are missing the voiceovers for the "Two Weeks from Tonight" cliffhangers and they made a change to Penny's scream in "There Were Giants in the Earth" and "The Hungry Sea." I'm certainly not a fan of edits, but in this case at least they are very minor although I don't understand why random seconds of dialog would be snipped out. Very strange. Maybe the PC police were doing their usual dirty work? A comment about "There Were Giants In The Earth", that weird looking, space alien "pet" that Penny finds, she calls it Debbie, later in the episode when the pet gets lost and Penny shouts- "Debbie? Where's Debbie?? Debbie! Debbie!!" LOL, I find that scene to be so annoying, I can't help but laugh whenever I see it. Good lord, yes. The full length pilot has a lot of cringeworthy dialog that was either cut or dubbed over in the shorter version. But that part is still a little grating.